The artistry of Marcelo Bielsa has transformed Leeds United into promotion favourites in less than a year. The win over Sheffield Wednesday on Saturday evening depicted their grit, determination and desire to put those darkest years behind and rise from the ashes shaking off all difficulties and limitations. Bielsa and his juggernaut are solely concentrating on the runners-up spot with four games remaining, but the board is already weighing up options for the summer transfer window and has identified Bolton teenager Luca Connell as one of the targets, according to a report from British tabloid the Sun. 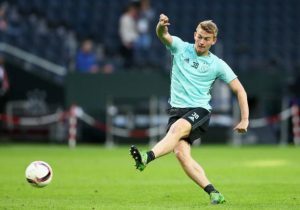 The 17-year-old Republic of Ireland youth international has progressed through the academy ranks of the Trotters since 2010 before breaking into their senior side earlier this year. He has made 10 appearances so far in all competitions and mostly featured as a deep-lying playmaker offering a great sense of positioning and intercepting attributes. Connell has been the shining light in a gloomy season for Phil Parkinson’s side who have an uphill battle in their hands to escape a demotion to League One. His emergence has drawn the attention of a host of Premier League outfits that include Tottenham Hotspur, Wolves and Everton. They, along with Leeds, are closely monitoring his growth as well as influence in the middle of the park and have scouted the youngster frequently over the past three months. Although joining a Premier League outfit of good reputation has to be more interesting over a team still uncertain regarding where their future lies in the next couple of years; a move to Leeds United would be more beneficial for his own development under the iconic Argentine’s tutelage. There he would learn the game more, enhance his skills and might also earn some first-team minutes due to Bielsa’s preference of promoting the youth over high-profile signings. The teenager, so far, has exhibited his confidence and composure over the ball, ability to drive it from midfield to operate in advanced areas, stride forward with swift dribbling traits, robust tackling attribute as well as shooting and long-ball accuracy. He has a strong left foot and could also be deployed as a left-back or left-sided midfielder. The versatility of Connell would add more creativity to Bielsa’s philosophy, tactics and gameplan to strengthen the root and brighten the future in the long run. Newcastle United Linked With A Summer Move For 27 Y/O Stoke City Midfielder: Good Fit For Benitez? Fulham Players Rated In Hard-fought Victory Vs Derby County: Denis Odoi Gets 9/10!